American Dairy Association North East dairy farmers recently took their messages to June Dairy Month events held at the Capitol buildings in Albany, New York, and Harrisburg, Pennsylvania. Dairy farmer Stacey Copenhaver of Tal-View Farm, Lebanon, Pennsylvania, spoke at the “Farm Show in June” press event in Harrisburg, June 5, that also served to promote the Fill a Glass with Hope campaign. Fill a Glass with Hope is a partnership with ADA North East, PA Dairymen’s Association and Feeding Pennsylvania, that works to get milk to families that need and want it through local foodbanks. “As a dairy family, we are dedicated to ensuring that delicious, nutritious milk continues to flow from our farm to other Pennsylvania families, and we’re proud to support hunger prevention programs like Fill a Glass with Hope," said Copenhaver. PA Dairymen’s Association provided free Pennsylvania Farm Show milkshakes, encouraged event-goers to donate to the cause. Donations tallied $2,100 during the event, and every dollar donated provides eight servings of milk. As part of ADA North East’s Fuel Up to Play 60 NFL partnership, former Philadelphia Eagle Jason Avant also helped promote Fill a Glass with Hope. Also, Justin Risser of Meadow Vista Dairy in Bainbridge, Pennsylvania, took two Holstein calves to display at the event and spoke with visitors about his family farm. In Albany, New York, the annual June Dairy Month celebration was held in the Well of the Legislative Office Building, on June 6. 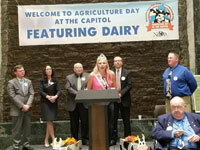 New York State Dairy Princess Hailey Pipher delivered a dairy message on behalf of all dairy farmers. She was joined by Alternate State Princess Alexis Payne, several county princesses and FFA students, to lead a milk toast, as well as offering dairy samples and educational materials. Dairy farmer and registered dietitian Abbey Copenhaver of Ivy Lakes Dairy, Stanley, New York, attended the event on behalf of ADA North East, sharing knowledge on the health benefits of milk and dairy products. She also answered questions about dairy farming practices.